Inspired by the entertaining sights and unique, carefree spirit of Venice, California, Fender created a soprano ukulele that captures its vibeâ€”the Venice Ukulele. Perhaps no other beach in the Sunshine State has inspired more lore or more stories of free spirits converging to mingle and express their artistry and personality than Venice Beach. 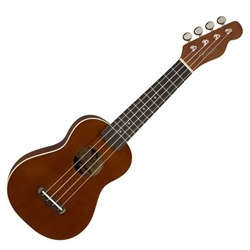 Thanks to its compact, comfortable body size, the Venice travels easily from the beach to the studio or jam room while retaining the classic, light sound that made the ukulele a “must-have” for today’s players.